At Sadler's Wells Theatre on the evening of 19 November 2015, China National Peking Opera Company had its London premiere of the classic "Warrior Women of Yang". 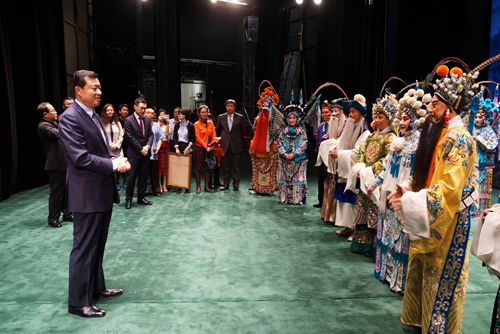 Chinese Ambassador to the UK Liu Xiaoming, Madame Hu Pinghua and more than 1,500 audience watched the performance. The dazzling performance of the Chinese artists and fascinating stories of "Warrior Women of Yang" won warm applause from the audience. At the end of the show, the audience stood up and applauded warmly for a long period of time for the excellent performance. 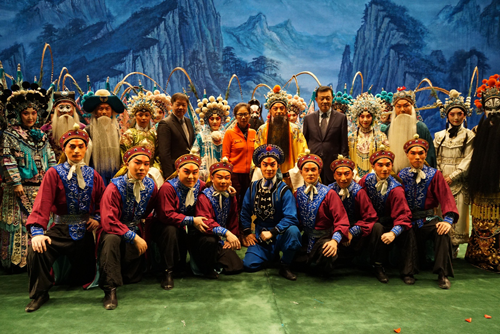 Ambassador Liu visited the CNPOC cast and crew after the performance to congratulate them on their successful performance. He expressed his thanks to them for coming from afar and bringing the quintessence of Chinese culture to British audience. According to the Ambassador, this show was both a powerful closing for the Year of Cultural Exchange and a brilliant fanfare for the opening of the "Golden Era" of China-UK relations, as this was the first art troupe to visit the UK after President Xi's state visit. Ambassador Liu hoped that CNPOC would continue to strengthen exchanges and cooperation with art organizations in the UK and make greater contribution to China-UK cultural exchanges. This was also CNPOC's first visit to the UK in ten years, and an important project of the China Season of China-UK Year of Cultural Exchange. The opera troup's premiere in London was preceded by two performances at Echo Arena Liverpool from 13 to 14 November and will be followed by four more performances of "Warrior Women of Yang" and "Farewell My Concubine" at Sadler's Wells Theatre from 19 to 22.